Costly technological innovations present ethical and policy challenges when budgets are limited and there are many patients who could potentially benefit. Should screening be used to identify candidates for treatment when they will then have to wait for substantial periods of time, balancing individual anxiety, depression, and stigma with potential changes in their risky transmission behaviors? Should highly effective but high cost treatments be offered relative to less effective but less expensive alternatives? If annual budgets are not sufficient to offer treatment to all eligible candidates, what is the most efficient, safest, and fairest way to prioritize patients for treatment and to actively monitor those that are waiting? This talk explores these challenges in the currently relevant context of hepatitis C virus (HCV) screening and treatment. The advent of highly effective new treatment regimens for chronic HCV has prompted calls to widen screening efforts to identify the estimated 100s of millions of infected individuals worldwide and to provide treatment regimens that cost $10,000s. The talk highlights core methods of the Society for Medical Decision Making which will be holding a conference and short-courses in Hong Kong on January 8-10, 2016. 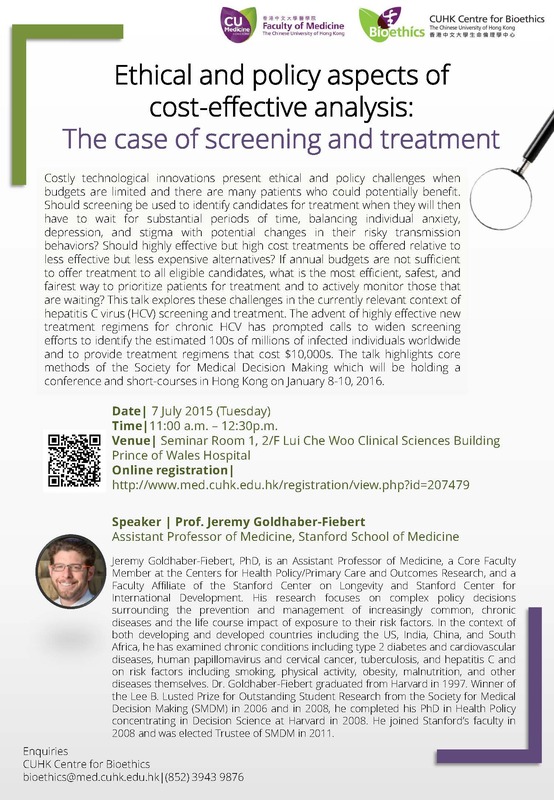 Jeremy Goldhaber-Fiebert, PhD, is an Assistant Professor of Medicine, a Core Faculty Member at the Centers for Health Policy/Primary Care and Outcomes Research, and a Faculty Affiliate of the Stanford Center on Longevity and Stanford Center for International Development. His research focuses on complex policy decisions surrounding the prevention and management of increasingly common, chronic diseases and the life course impact of exposure to their risk factors. In the context of both developing and developed countries including the US, India, China, and South Africa, he has examined chronic conditions including type 2 diabetes and cardiovascular diseases, human papillomavirus and cervical cancer, tuberculosis, and hepatitis C and on risk factors including smoking, physical activity, obesity, malnutrition, and other diseases themselves. Dr. Goldhaber-Fiebert graduated from Harvard in 1997. Winner of the Lee B. Lusted Prize for Outstanding Student Research from the Society for Medical Decision Making (SMDM) in 2006 and in 2008, he completed his PhD in Health Policy concentrating in Decision Science at Harvard in 2008. He joined Stanford’s faculty in 2008 and was elected Trustee of SMDM in 2011.